Treloar claims the J.J. Joyce Trophy for finishing in third place in the club's best and fairest. Image: AFL Photos. It’s been two years since Adam Treloar moved to the Holden Centre. In that time, he’s been nominated for two All-Australian berths, has missed only one game for the Pies, has polled 32 Brownlow votes, and has placed in the top three at both Copeland Trophy ceremonies. Did we mention he’s still only 24 years of age? Treloar is one of the most exciting midfielders in the league, and in 2017, he worked tirelessly in Collingwood’s engine room. Whether he’s on the burst from 50m out heading towards goal, or running between the arcs to support his defenders, Treloar wills himself to every contest, and has an impact almost every time. This season, he averaged 30 possessions a game – including 11 contested – six tackles and five clearances, whilst also hitting the scoreboard with 13 goals. 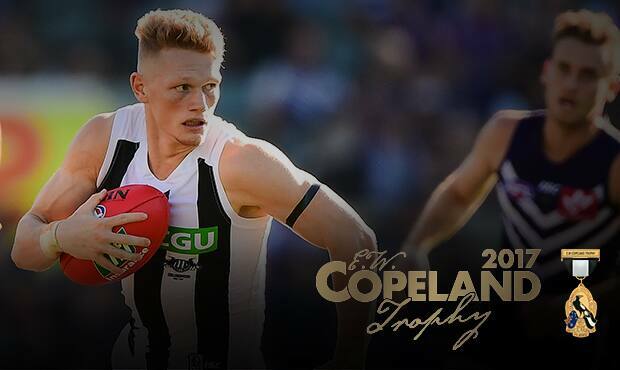 With 111 votes awarded to him from his coaches, Treloar places third in the club’s best and fairest voting, claiming the J.J. Joyce Trophy. They don’t come any more passionate than Adam Treloar, and we couldn’t be happier to have him in the Black and White stripes.